Showing 9 results for "trauma"
Should we talk about REBOA? 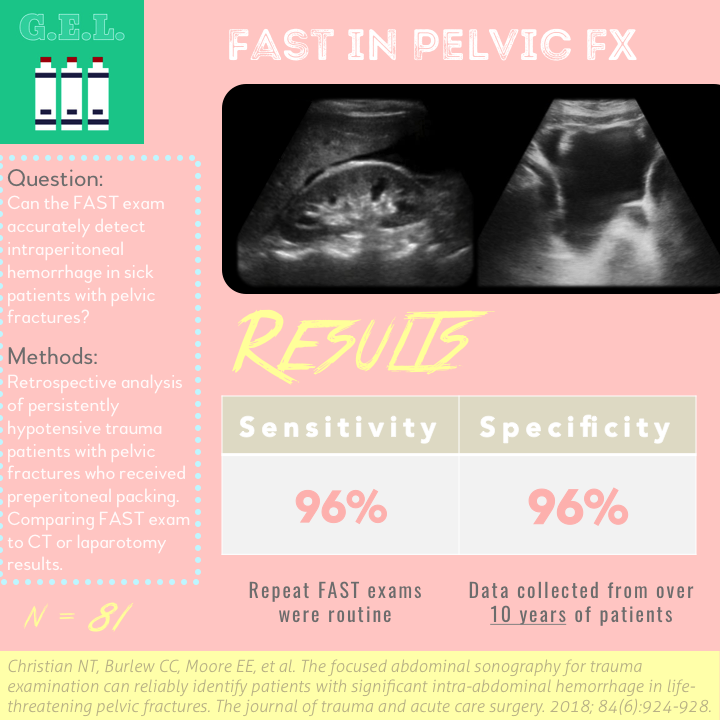 The FAST exam is tried and true for trauma, but in the past it hasn't been super useful for patients with isolated pelvic fractures. This study teases out a very sick subset of this population - patient who have significant hemorrhage associated with their fracture. The question is how well can the FAST identify intraabdominal hemorrhage in these people. The authors' idea is that if the FAST can find intraperitoneal blood, it might help determine who would benefit from REBOA instead of laparotomy. The RUSH exam is a family favorite. 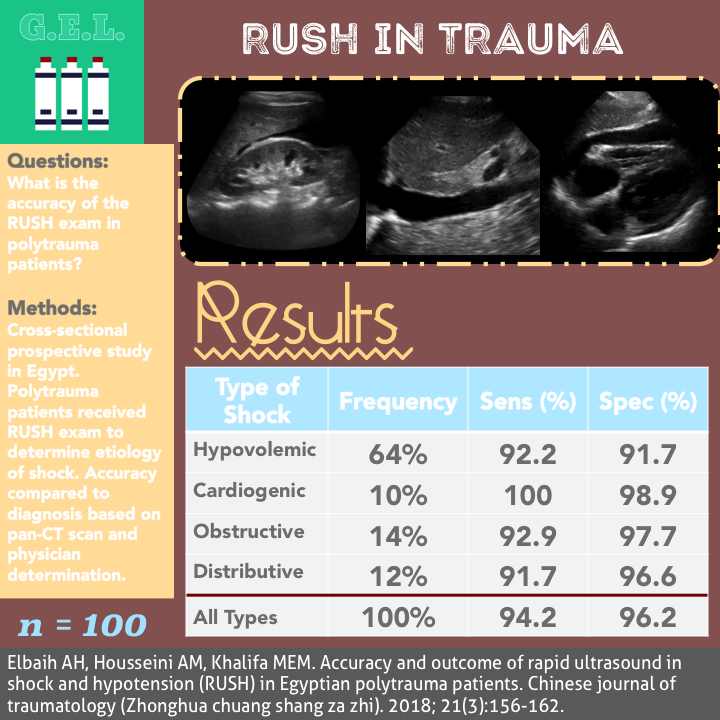 It's a reliably easy to recall hypotensive protocol that uses ultrasound to help determine the etiology of a patient's shock. Well here's a new idea - trauma patient's can be in shock too, right? So maybe we should perform a full RUSH exam instead of just a measly EFAST? Well...hold your horses there kiddo, there may be more to think about with this one. The FAST exam is one of the founding fathers of point of care ultrasound. As ultrasound creeps into the pediatric world, it is being used in trauma patients to assess for intraabdominal injury. 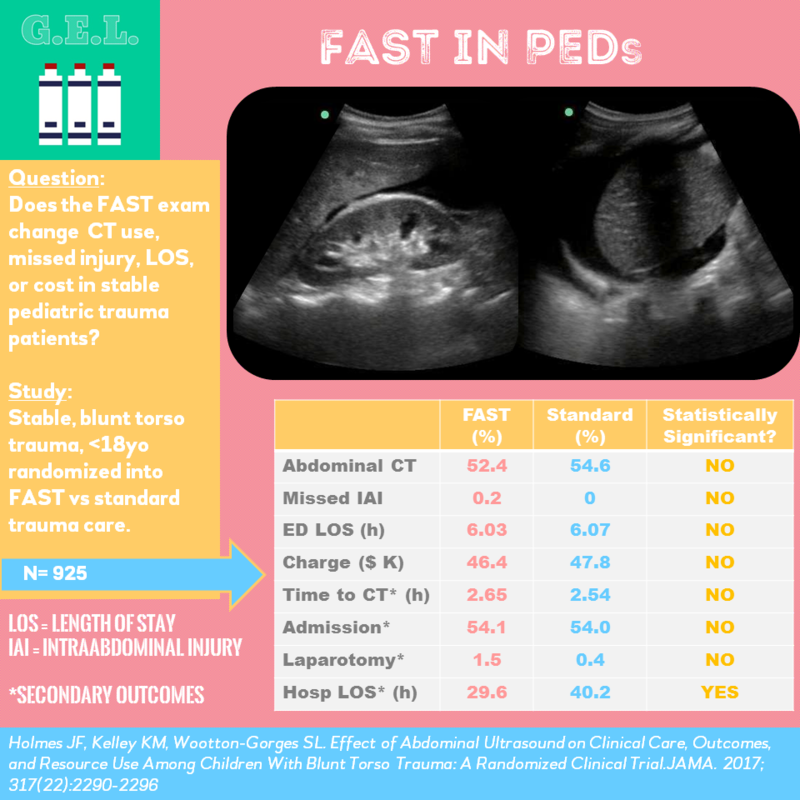 This article looks at what happens when you apply the FAST exam to a stable pediatric patient with blunt torso trauma. Spoiler Alert! - nothing happens. We discuss what this study shows us, how FAST can be used in pediatrics, and further directions of this modality.